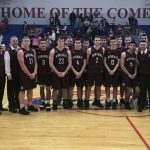 The Winamac Warriors and Laville Lancers have tied to be Co-Conference Champs. They have a tied record of 6-1 in the HNAC conference. Boys Varsity Basketball · Feb 23 Boys’ Varsity Basketball falls to Rensselaer 58-44. Boys Varsity Basketball · Feb 20 Boys Varsity Basketball beats Caston 57-28. Boys Varsity Basketball · Feb 8 Boys varsity basketball beats North White 74-50.